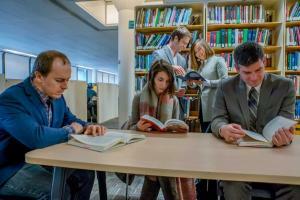 The Political Science Department is a dynamic, research focused department that offers many opportunities for doctoral engagement and development. The PhD program is designed both for students interested in pursuing academic positions and also for students interested in working in research capacities in the public, non-profit or private sectors. We offer students the opportunity to concentrate on traditional subfields of political science, in particular Canadian Politics, Comparative Politics, and International Relations. But our program also offers the opportunity to specialize in fields where our department boasts specific expertise, namely in Law and Politics; Public Policy and Governance, and Gender, Race, Indigeneity and Sexuality (GRIS). Students choose two fields of study (major and minor) and take full-year reading courses in each field to prepare them to write Qualifying Exams. PhD students are also required to take two research methods courses (though it is possible to waive one of these requirements if a student can demonstrate that they have taken an equivalent methods course at the graduate-level). Finally, students take two elective courses (with the possibility of taking one of those courses in a discipline related to Political Science). Canadian Politics studies how institutions (legislatures, executives, courts and constitutions, etc. ), groups (parties, interest groups, social movements, the public, etc.) and events (elections, First Ministers’ conferences, political violence, etc.) interact to shape and reflect Canadian politics and identity. Consistency and change in the underlying dynamics of Canadian politics, such as regionalism, language, Quebec, indigenous and Métis peoples is explored. Comparative Politics compares jurisdictions using quantitative or qualitative methods to develop and test theories that relate to the core concepts in the discipline. These concepts include power, the state, regimes and regime change, social movements, institutions, interest groups and political parties. Gender, Race, Indigeneity, and Sexuality (GRIS) explores the relationship between identity, politics and power. The ways in which different modes of identity intersect and the implications of that intersection for politics and policy are also examined. Methodological debates about how to study identity and politics will be critically analyzed. International Relations seeks to understand and explain complex interactions between international, regional and local actors using theory and empirical examples. A variety of different subfields explore various aspects of these relations from conflict to international political economy to global governance. Law and Politics explores questions around how law and courts influence and are influenced by politics. Topics include the relationship between courts and other government actors; judicial decision-making; legal mobilization and the interplay between courts, rights and public policy. Public Policy and Governance seeks to identify and explain how governments determine what is a problem, what solutions to problems are proposed, and how solutions are implemented and evaluated. Relationships between the political executive and bureaucracies, the public sector, non-governmental organizations, and the private sector are explored in this context.